Jesus said: "Most assuredly, I say to you, he who believes in Me, the works that I do he will do also; and greater works than these he will do, because I go to My Father" (John 14:12). Jesus said His works would continue and even in a greater way, because when He returned to the Father, He would send the Holy Spirit so that His disciples then and of the future would be carrying on His works. No Christian anywhere can say that every sick person they ever prayed for were healed. But the excuse that says, “It is not God's will” has -0- Biblical support and helps no one. On the contrary, it makes us doubt God's will and power in us, that He continues to heal and perform miracles. I know how much damage it can cause from my own experiences. Nine years ago, I had the great blessing to receive prayer from a missionary couple. They prayed for me to receive an impartation of the anointing that was upon their lives. The experience was amazing and what I had longed to have for years. The Holy Spirit filled me and gave me the firm belief that God still works through miracles. Even if I had already been baptized in the Holy Spirit for a decade at the time, I never had such faith before. At first, all those I prayed for were healed. Many of them were not even born-again Christians or persons of faith for receiving healing, so I knew God was answering because of my faith. James 5:15 "And the prayer of faith will save the sick, and the Lord will raise him up. And if he has committed sins, he will be forgiven." So, it is the prayer of faith receives God's answer. Faith is the key. These verses about faith are intrinsic to having effective prayers. Romans 10:17 "So then faith comes by hearing, and hearing by the word of God." Hebrews 11:1,6 "Now faith is the substance of things hoped for, the evidence of things not seen..."
6 “But without faith it is impossible to please Him, for he who comes to God must believe that He is, and that He is a rewarder of those who diligently seek Him." What happens when we are surrounded by people with negative faith, who believe that God is not healing today; or by ones who are so pessimistic that their only focus is the "empty half of the cup" and are completely blinded to the fact that at the same time, the other half is a full half? What happens when sermons are repeatedly "heard" that go against miracles and the gifts and workings of with the Holy Spirit? After hearing so many prayers such as: "God please heal this person, but not our will be done, but Yours" or "Lord, if you want this person to learn something from this disease, then just give them strength to endure" and with hearing many other variations of this same theme, my faith began to go downhill. Have you ever experienced the same? It took me some time to realize what was happening to me, as my prayers were not getting answered as they used to. Then it took time and perseverance to get back to believing the truth that it is God's will to heal us and that God is not the source of disease and affliction. Also, God does not force faith anyone to become His child or trust His Word against their will. I have shared my experience, because I am 100% sure that many others have gone through or are going through something similar. We all need to realize what has been holding us back and get to the position of faith and trust, where God wants us to be. The Lord wants us totally dependent on Him and He wants to accomplish His plan in and through us. Why? Because it's the safest and best way to live, living effective and fruitful lives and eventually making it to Heaven and being with the Lord for eternity! There are many verses that state how Jesus healed all those who came to Him. So what does "He healed them all" really mean? It means literally that no sick or disabled person remained unhealed after they came to Jesus. The first condition that they met, was recognizing that they needed healing and believing that Jesus could heal them. Jesus replied to most of their requests with: "According to your faith, let it be to you." So they were receiving healing because they believed for it. 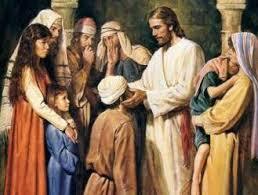 Then, they acted accordingly and came to Jesus and asked Him to heal them. Does it require less faith for the healing of a cold than for cancer? Would it be that God would cure a headache, but not a major sickness? It only takes the faith of the size of a mustard seed, no matter what. And God is not troubled whether He is healing a headache or something major. Jesus did the Father's will, which was and still is to heal all! God is not the source of any illness and does not want us to be sick. Maybe you think it can't be so, because God is sovereign. That is true! God is sovereign and the absolute Lord over all! But He created us with “free will” allowing us to choose between obedience and disobedience. From Adam and Eve on forward, the human race has continued to sin and rebel and living with the curse and the consequences of it. The curse of sin has brought sickness, suffering and death. Before Adam and Eve sinned, all was good. We live in a world reeling from the curse of sin. As Christians, Jesus came to deliver us from sin and the curse of it. And yet we still sin. It is utterly amazing that one of the most common “first reactions” to sickness is: "Lord, why did You give this to me or allow this to happen?" When in fact, our first thought should be: " Oh Lord did I sin knowingly or unknowingly that I might have opened the door to allow the devil to attack me with this suffering?" Whether it was allowed or caused is something to personally, introspectively and prayerfully consider. The disciples assumed that disease and disorders were only due to sin, because the rabbinic teaching on the matter was: "there is no death without sin and there is no suffering without iniquity." They were certainly some sickness of which sin was the cause, but they were not sure if it was the generational sin transmitted from the parents (as we see in the Old Testament) or if it was the man's sin. With this manner of thought, we would now wonder how could a fetus sin in the womb? Believe it or not, in those times, in order to sustain their teaching, the rabbis were debating if the unborn child could sin or not. Jesus brought the cause of sickness or infirmity into a new perspective. He said that God may use a disability or illness to show His glory by healing it. Our Lord, revealed once more, the loving and compassionate heart of Father God. He healed the blind man using a new method that tested the man's faith. The man had to accept the mud in his eyes, then go to a specific pool, wash out the mud and afterward, he could see well. Jesus healed every sickness or infirmity, as He said He was doing: "the works of My Father" (John 10:38). Jesus did the works of God, His Father, and we are to do the same and we can IF we abide in Jesus and He abides in us (John 15:7). The more we become one with Jesus, the more He will use us to do His works. As we pray in the Name of Jesus Christ, we will receive the answer. He came to cancel the curse of sin and its effects. Once a person repents of sin and asks Jesus to be their Lord, he is forgiven and heir to all the benefits that Jesus won on the cross - including healing by faith, as long as he keeps a clean heart, staying in Christ and Christ in Him as true Lord. Acts 10:38 "how God anointed Jesus of Nazareth with the Holy Spirit and with power, who went about doing good and healing all who were oppressed by the devil, for God was with Him." The Greek word used in the original, for "all" is "pas" and it occurs more than one thousand times in the Bible. It means "all, the whole/entire, every kind of." So there was no sick person, that went to Jesus that was not healed of whatever disease or disability they had. There is no verse in the Bible that says that it was not our heavenly Father's will for them all to be healed. I don't think that anyone suggest that only “sinless people” went to Jesus seeking healing and that's the reason they received what they asked for. Paul records that there is no one without sin, not even a super saint, but only Jesus Christ lived a life without sin. He never even sinned once. After people started hearing of how the woman with the issue of blood, was healed by touching the hem of Jesus' garment, many believed they would be healed the same way; and they were also! Matthew 14:36 "and begged Him that they might only touch the hem of His garment. And as many as touched it were made perfectly well." The original term in Greek for "abide" is "meinēte" with the root being "mein" = to abide, remain, stay, dwell, wait, persevere, persist, endure, continue. In fact, all these terms show that to get to the place where we are so full of the Word of God, that we abide in one accord with Jesus (us in Him and He as Lord in us) that we need to go through all the meanings of the word "mein" to be there. To get to live in the Word, we need to persevere in reading and studying it; to seek the Holy Spirit for the revelation of what we need to understand. It means enduring criticism and being ridiculed for our love of God and working hard to discipline ourselves to do what God's Word says, despite our carnal nature that would have us go against what God commands and directs. It takes continuity and perseverance in studying the Word, to be able to remain in the Truth. We will not know what the Bible truly says about important issues that we struggle with and face daily, if we do not study. Many times we have to seriously seek and wait upon the Holy Spirit for the specific revelation we need. The Word that is "revealed to us" - "by the Holy Spirit" is what gives us "the faith to move mountains!" Matthew 17:20b "if you have faith as a mustard seed, you will say to this mountain, ‘Move from here to there,’ and it will move; and nothing will be impossible for you"
Have you wondered why our "prayers being answered" is directly connected to us abiding in Him and He abiding in us? When God's Word becomes so real and important to us that it becomes our first nature, our faith will become strong and trust completely in what the Bible says. This is the faith that gets the answer. Is it enough to read the verses that refer to our matter once and we are done? How does reading and even quoting Scripture make them becomes so real to us? That alone does not do it. We must have the Holy Spirit make the message of those verses penetrate our hearts and become real to us. Then His Word begins "to work" in our inner man, helping us grow strong in the bold confidence that God will be true to His Word. If we skip this step, we will not be going anywhere. The devil and negative thoughts will cause us to doubt that we will get anything that we asked for. We need to "build our faith" so that we will receive what we are asking for, based upon one or more Bible verses and after that, we pray accordingly. In order to develop an "unwavering confidence" and be convinced that God will do what we pray for, we ask the Lord to help us discover what Scripture says on the matter and He helps us through the teaching and revelation power of the Holy Spirit. Then, believing in our heart, after-which we proclaim the verses (that have gone from logos to rhema, from written or communicated to alive and empowered) until they become full and powerful us. No one has ever began the Christian life, with an already renewed mind, knowing what the Bible says, because it takes the process of time with study, application and growth. There is 100% new birth when we become born-again and it occurs instantaneously when the Holy Spirit enters into the person that repents and asks Jesus Christ to become Lord of their life, giving their all to Him. In the spirit, all becomes new. In the physical, the carnal nature must be brought into obedience to God. A Christian's transformation, begins at salvation and continues as long as the person lives for Christ. This continuous process develops true Christians to become more and more like Jesus. We are constantly tested and it is up to us to be true disciples, living a victorious life truly pleasing to the Lord. Having the faith that "moves mountains" takes effort, dedication, passion and even many tears. Some of joy, when we realize who God is and how much He loves us; and others while persevering. Praise the Lord, He is always there for us to get us through every trial. The more we look at and trust in Him instead of focusing on the problems, the better it will be. In other words, if you don't have a strong faith yet, don't despair! Faith is something that grows with exercise and God never asks us to do anything that He does not enable us to do. Matthew 8:13 "Then Jesus said to the centurion, “Go your way; and as you have believed, so let it be done for you.” And his servant was healed that same hour." Matthew 9:22 "But Jesus turned around, and when He saw her He said, “Be of good cheer, daughter; your faith has made you well.” And the woman was made well from that hour." Matthew 9:27-30 "When Jesus departed from there, two blind men followed Him, crying out and saying, “Son of David, have mercy on us!” And when He had come into the house, the blind men came to Him. And Jesus said to them, “Do you believe that I am able to do this?” They said to Him, “Yes, Lord.” Then He touched their eyes, saying, “According to your faith let it be to you.” And their eyes were opened. And Jesus sternly warned them, saying, “See that no one knows it." Matthew 15:28 "Then Jesus answered and said to her, “O woman, great is your faith! Let it be to you as you desire.” And her daughter was healed from that very hour." Praise the Lord, that we find recorded in the Bible the proof that God continued to heal all the sick that came to the apostles, even after Jesus went back to heaven. We also read in Acts, that when the apostles prayed for multitudes, all received healing! Jesus told the disciples to do the work of the Father as Jesus was doing. Jesus did not give the disciples limits or exceptions and the same applies to us. He never said to pray only for certain or specific sicknesses, dead or demon possessed people. We freely received Jesus in our hearts, so we are to freely give the benefits of the power of the Holy Spirit to those who are in need. The disciples did powerfully continue the work to all. Acts 5:16 "Also a multitude gathered from the surrounding cities to Jerusalem, bringing sick people and those who were tormented by unclean spirits, and they were all healed." The disciples, with the power of the Holy Spirit and a firm faith, did continue the works of Jesus as they ministered to the multitudes, they were ALL healed! For those who truly believe, nothing is impossible with God. When Peter healed Aeneas, the lame man, “all” there at Lydda and Sharon saw it and came to the Lord. Acts 10:44-45 "While Peter was still speaking these words, the Holy Spirit fell upon all those who heard the word. And those of the circumcision who believed were astonished, as many as came with Peter, because the gift of the Holy Spirit had been poured out on the Gentiles also." Acts 19:11-12 "Now God worked unusual miracles by the hands of Paul, so that even handkerchiefs or aprons were brought from his body to the sick, and the diseases left them and the evil spirits went out of them." To be healed, we need to realize and believe that we receive healing at the moment of prayer, because what Jesus Christ did through His sacrifice on the cross. In doing so, the healing will become a reality for us physically. Then, if we believe that we've been made whole, we will act according to our faith, doing what we could not do before healing. Is not always easy to have faith, but by aligning with what Scripture says, we do receive the answers. I know personally it is possible and even as Paul says: "I can do all things through Christ who strengthens me" (Philippians 4:13). Even a little doubt, is a huge enemy. Unless we are firmly convinced that God's will for us is to be healed, the enemy will place doubtful thoughts in our minds which will rob us of our healing. How do we handle these thoughts as they come to our minds? We know that they do not come from God. So they originated in our flesh or from the evil one. It is up to us to stop meditating on them and not let them grow. We will fight against them, by proclaiming the bible verses that prove that God's will for us is to be healed (Here are listed some verses to help: Healing By Faith - Bible Verses). Mark 11:23 "For verily I say unto you, That whosoever shall say unto this mountain, Be removed, and be cast into the sea; and shall not doubt in his heart, but shall believe that those things which he said shall come to pass; he shall have whatsoever he said." So, when doubt tries to enter and occupy our minds, we will open our mouths and start to declare the bible verses that are the truth on the matter. Our mind will begin to accept the truth and that will cause our spirit (our inner man, our heart) to be changed also, by replacing the lie of doubt with the truth of the Bible. By doing so, we will strengthen our faith and as a result we will own what we prayed for! 1 Peter 5:6-9 "Therefore humble yourselves under the mighty hand of God, that He may exalt you in due time, casting all your care upon Him, for He cares for you. Be sober, be vigilant; because your adversary the devil walks about like a roaring lion, seeking whom he may devour. Resist him, steadfast in the faith, knowing that the same sufferings are experienced by your brotherhood in the world." James 4:7 "Therefore submit to God. Resist the devil and he will flee from you." It is up to us to resist, to fight against the devil and his attacks and not believe his lies. The Apostles Peter and James are very firm when they tell us to do so. To resist is not a passive act, on the contrary, it involves action and it will work as long as we live in submission to God. Matthew 28:18-20 "And Jesus came and spoke to them, saying, “All authority has been given to Me in heaven and on earth. Go therefore and make disciples of all the nations, baptizing them in the name of the Father and of the Son and of the Holy Spirit, teaching them to observe all things that I have commanded you; and surely, I am with you always, even to the end of the age.” Amen. " Our strength comes from Jesus Christ, our Lord. As long as He is ruling our lives and we are living in obedience to Him, when we proclaim the Name of Jesus, the devil will flee and his attacks (pain, symptoms of sickness, helplessness, fear, depression, worries, etc.) will end. On our own, apart from the Lord, we do not have the slightest power or authority in ourselves to fight spiritual warfare. All authority belongs to Jesus, and by Him, we have it, too. Only in Jesus, we can resist the evil attacks and win! So, if we feel the symptoms of the healed sickness, as it tries to come back in our body, we will fight against it, proclaiming by faith, what the Bible says. For those who aren't familiar with spiritual warfare, proclaiming biblical truth may be something like: "In the Name of Jesus Christ, I am healed! Pain, sickness (you can name what you are personally fighting) you have no right to come back into my body. Jesus bore my disease in His body on the cross and by His stripes I am healed! Jesus has already done everything that was needed for my healing and by faith I took already took possession of my healing. I was healed by God's grace, not by my merits. Thank You Lord God, Amen." Bible verses and personal declaration to help build one's faith and get healing. What does the Bible says about healing and faith & how to stand against negativity & doubt. Scripture to encourage one's faith & stand against negativity & doubt. Scriptures that prove this wonderful truth! Was it a real sickness, or was something else. A complex bible study on this subject. What does the Bible say on the matter and what does real science say? Copyright 2015 Carmen Pușcaș. May be used for personal study or instruction but shall not be copied and/or distributed in whole or part without permission or for financial profit.